The Navy and Marine Corps Commendation medal was originally a service ribbon first awarded in 1943. It was changed to a medal in 1950 and underwent several design and name changes until the current decoration, criteria, and title was established in 1994. The medal is awarded for meritorious service or achievement in a combat or non-combat situation based on sustained performance of a superlative nature. Unlike the comparable awards for the Army and Air Force, the Navy and Marine Corps Commendation Medal has historically been of a higher precedence level and is less frequently awarded. 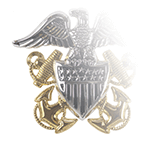 Typically, its recipients for meritorious service are department head level officers at the O-4 level, senior Navy Chief Petty Officers (CPO), some senior Marine Corps non-commissioned officers (and, increasingly, some junior officers) as an "end of tour" award, or some enlisted personnel as a retirement award. To be given for heroism, the act must stand out, but to a lesser degree than required for the Bronze Star in combat or the Navy and Marine Corps Medal in a non-combat situation. 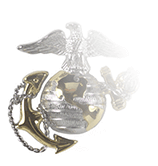 A “V” device is authorized for wear when the award is issued for heroism in combat. 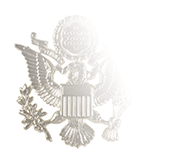 In 2016, the Department of Defense announced that two new letter devices, “C” and “R,” were authorized to be issued with the Commendation medal. 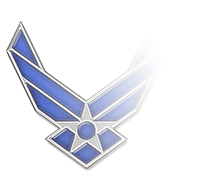 Defined as the “Combat Conditions” device in ALNAV 055/17, the “C” indicates that the wearer under the medal while personally exposed to hostile action or under significant risk of exposure to such action. The “R” device is issued when the recipient performed an act that had a “direct and immediate impact on a combat operation or other military operation” while under no threat of exposure to hostile action. 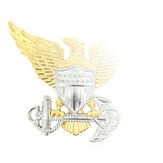 With these changes, the Navy and Marine Corps Commendation Medal became one of just five that can be issued with the “V,” C,” and “R” letter devices, but ALNAV 055/17 states explicitly that only one device is authorized for an award given in recognition of a single act or meritorious period of service. Designed by the Institute of Heraldry, the Navy and Marine Corps Commendation medal is a bronze hexagon with the eagle from the Department of Defense's seal in the center. The back is inscribed "For Military Merit" with room for the recipient's name to be engraved. The medal hangs from a dark green ribbon with a narrow white stripe near each edge. Additional awards are denoted with gold stars. A bronze "V" for "valor" can be authorized as a combat distinguishing device.